There are lots of lists and suggestions for all interests and you can ask people you know or follow to share their interest circles with you directly, either in private or publicly. Click on the "Add people" and it opens a box with all the people in the circle. When you hover on top of the profile's "cards" there is a x in the top right corner. Click on that to delete. Or if you wish to delete more, hold down the cmd key on Mac, ctrl key on PC and click on the cards you wish to remove: Then choose "Delete" from the top. The profiles that are left will be added to your chosen or new circle when you click on "Create or add to circles". You also may click on some "cards" and select only those to be saved in your circle. 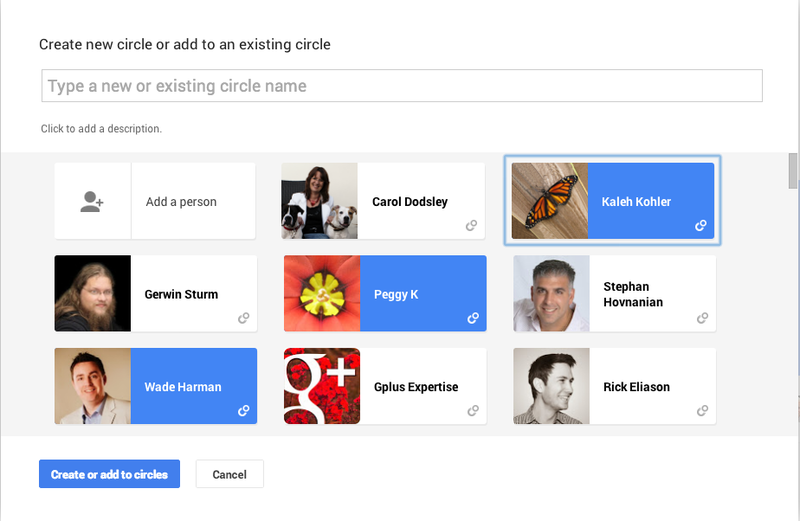 Adding people to existing circles: Start typing a circle name and Google+ will suggest your circles, choose one. I'd rather you always create a new circle, however. Create a new circle with all the people, name it "Jaana's circleshare" or similar from the original sharer. This way you can take a look at that circle's stream and remove easily those whose posts you are not interested in. Or if you don't like anything it's easy to delete the whole circle. Just because I think the people in the circle are interesting, you may not find them so - and that's quite okay. It all depends on our interests. This circle is a subscription circle: I get notifications from all the posts. Give an explanation why you'd like to share this circle so that people will know if it's your woodwork / knitting / doglovers circle or your scientists one... :-) You don't have to reveal the actual name you've given to the circle. There is box you can tick if you want to include yourself in the circle, to be shared onwards. How to get included in a shared circle? There are many millions of people in Google+ with different tastes and preferences. Every once in a while I've had unpleasantly 'pushy' and/or derogatory experiences in the stream, not just in my own posts. When someone goes through the trouble of curating and choosing the people in a circle and then shares the ready circle, what makes you think you should be in it? Or your friend or Hangout pal? Or even the really 'cool people' on the top of the G+ lists? "Add me!" comment is pathetic, sorry. "Me me mememememeeee"... That is the problem. Respect the choices and decisions of other people, then they in turn will respect yours. There's no rhyme or reason to the content of the circle if anyone can opt in. It's just gaming the platform and only the ringleaders really benefit. The poor sods who add those circles in order to get in, get spammy Home stream, their profile linked to the scammers / spammers -> has an effect on Google search and What's Hot stream results. If you have circled people very randomly and have added "megahugeballcircles" getting a lot of spammers connected to your account, that may have an effect on your future circling abilities, too! How to get in those GOOD shared circles, you may ask? - Show that you have what it takes to be included! Don't wait for your friends to join G+! Google+ is different from other platforms and needs a bit more work than, lets say Pinterest. But once you've understood what the idea behind Circles is, the rewards are great. Don't wait for your friends and family to join you but venture outside your comfort zone and you might be surprised! Even now only a handful of people I know IRL are here. But I really don't care as I have a Circleverse full of great new acquaintances and in many cases, new friends, too. It's just a question of finding your niche. And making an effort. My 5 C:s are: Circle, curate, create, communicate & consume! Use the search for your pet topics, music or sports, look at the people's profiles who comment on those posts and circle, circle, circle... Join communities. Then comment, post, share and circle again. Repeat and keep on repeating. People love it when you share their posts. Add your own message when sharing to your circles or re-sharing in Public and you will make it seem much more personal. You can still share posts with them via email address in the 'Share' box. All the blog articles tagged "Circles"
Do you know of more posts or articles on this topic? 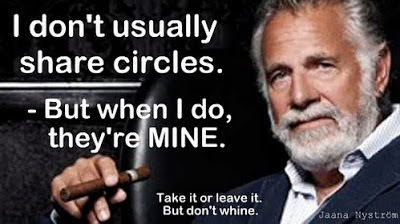 Having trouble circling people on Google+?